This is a biggie. Literally. 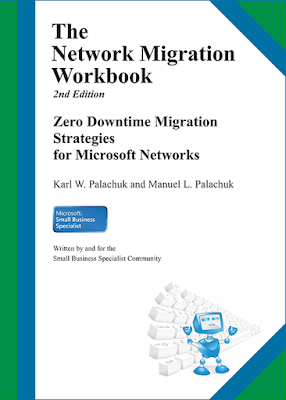 The 596-page Network Migration Workbook (2nd ed.) is now included in the downloadable content in the Small Biz Thoughts Community. This book originally sold for $299.95 and currently sells for $149.95. It is a massive work that took thousands of hours of labor. Download zip file includes checklists in Word Doc format and additional files. The first 250 pages are chapters on project design, management, and all the details of running a Zero Downtime Migration project. The final 220 pages are the super, monster, thorough checklist (which is really a series of nested checklists). Total zip file is just over 11 MB. You can read lots of details on the book page here or even more at www.networkmigrationworkbook.com. Let's be honest, anyone can perform a network migration WITH downtime. You simply kick everyone off the system, put the client out of business for some period of time, and push through until you're done. Without downtime is another story. Without downtime . . .
You look like a hero! Now includes the complete checklist for SBS 2011! Total value of downloads within the Small Biz Thoughts Community is now over $3,375! New Low Price on the 4-Volume Set of SOPs!